In our last post, we talked about how Dr. Jill Wade is using OralDNA to asses a patient’s risk for HPV-related oral cancer. In this post, we’ll take about a look at another great tool we’re using at Stonebriar Smile Design in Frisco. It’s called VELscope. With VELscope, it’s possible for Dr. Wade to identify potentially cancerous tissue when it can be hard to make a diagnosis with the naked eye. How Does An Oral Cancer Screening With VELscope Work? 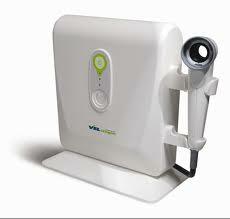 VELscope is a fluorescence-based system that is painless and takes just minutes to complete. During your screening, Dr. Wade will simply shine the VELscope light in your mouth as she completes a thorough oral exam. Under this light, healthy tissue glows green while tissue that may require a second look looks dark. That’s all there is to it. When combined with OralDNA, X-rays, and a traditional oral exam, VELscopecan be one of the most effective tools used in the fight against oral cancer. Do you want to learn more about oral cancer and how Dr. Wadecan screen patients? Call our Frisco dental office today with your questions, or to schedule your next visit. We serve patients from Plano, McKinney, Allen, Dallas, and The Colony.